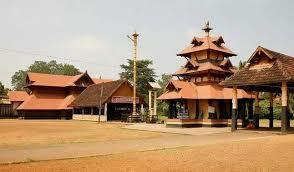 Here is Some Information about Sree Vallabha Temple in Thiruvalla Kerala India. 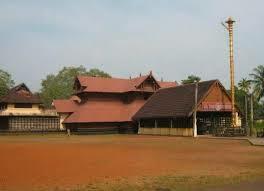 The Sree Vallabha Temple is located in Thiruvalla Sub district of Pathanamathitta District of Kerala.Thiruvalla Sreevallabha Temple a unique one situated on the Bank of Manimala River . It is believed that this temple was built about 4000 years ago. Temple remains is enclosed on all four sides with walls whose height is 12 feet and its length in each side is 566 feet on the east and west exactly in the middle of the wall the gate towers (Gopuram) of equal dimensions can be seen on the other hand in the north and south gate towers (Gopuram) of different dimensions can be seen. The flagstaff of this temple is a monolithic structure of black granite 50 feet in height. At the top of this staff is an image of Garuda. Sreevallabhan is portrayed as bearing a lotus in right hand, chakra in right upper hand, sankha in left upper hand and his left hand kept on his waist. This 7 feet tall massive idol is situated at a height of 10 feet in such a way that one has to bend his body to see it and its top and bottom cannot be seen. 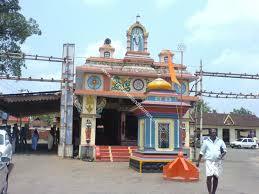 Thiru uthsavam and Uthra Sreebali are the two main festivals of Sreevallabha Temple. The idol of Maha Vishnu or Sree Vallabha was sculpted by Viswakarma at the behest of Lord Krishna and was given to Satyaki at the end of Dwapara Yuga. Towards the end of Dwapara Yuga, Lord asked Garuda to keep the idol in safe custody and accordingly Garuda kept it in Netravati river which flows from Karnataka to Kerala. Later, the royal consort of Cheraman Perumal - the emperor of Kerala had a dream that the idol of Krishna was lying on the bed of Netravati river. All efforts were taken to search the idol. At last the idol was discovered from the Bhadra Hrada of Netravati river in B. C 59 with the joint effort of the Tulu Brahmins and the local potties (Malayala Brahmins or Nampoothiries). 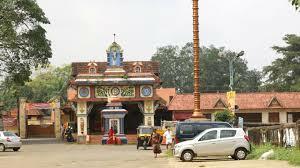 Cheraman Perumal built a temple at Thiruvalla to install the idol. The Prathishta (installation) ritual was conducted on 14th day of Edavam in B.C 59 (Kaliyugam 3043). The temple compound is more than 8 acres. The huge compound wall is 12 feet high and 562 feet long (in one side). There are four gopurams (in typical Kerala style)in four directions. North gopuram will be opened only on Uthram day in Meenam. While entering through the main gopuram the devotees will first see the three storied Garuda Madam. Inside this Garuda Madam there is a 53.5 feet high and 2.5 feet wide granite dwaja. A granite dwaja was carved out of single piece and was installed here in B.C 59 as an offering to Lord Sree Vallabha by Queen Cherumthevi, the wife of Cheraman Perumal. At the time of installation of the dwaja, Garuda appeared himself at the top of the dwaja. This dwaja till remains as a wonder. Later the dwaja slanted. So a structure called Garuda Madam was constructed to support the dwaja. It was designed by the legendary Perumthachan. 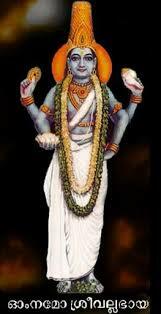 He made a 3 feet high panachaloha Garuda Vigraha (idol) to install on the top of the dwaja. This was the original dwaja of this temple and later a separate golden dwaja was installed in between Garuda Madam and the balikkalppura on 14th May 1970. By Road : There are many public and private vehecels available to reach Sree Vallabha Temple in Thiruvall. By Rail : The Nearest Railway station is Thiruvalla, about 3 km away. By Air : The Nearest Airport is Kottayam.